Microsoft Dynamics 365 vs SAP Business ByDesign. What is the best Online ERP software? Microsoft announced the general availability of Dynamics 365 - the cloud solution combining its ERP and CRM that will compete with Salesforce. It costs from $70/user/month and provides web interface and mobile app, or can be used inside the familiar Outlook apps. 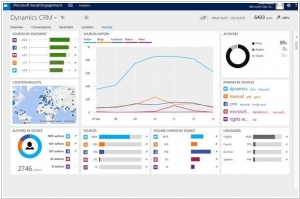 Microsoft has also built in a couple of intelligence features into the release designed specifically for sales and service personnel. First, there is Customer Insights, a stand-alone cloud service, which enables users to bring in a variety of internal and external data sources (like Facebook and Trip Advisor). The second piece is called Relationship Insights, which as the name suggests gives sales people information about the status of their customer relationships at any given moment. It’s built on the on the Cortana Intelligence Suite, which Microsoft introduced in 2015 and uses tools like sentiment analysis to check on the likelihood of the deal closing and the next best action to take. So, Microsoft has consolidated its artificial intelligence tools into a single, coherent division and just about every vendor - not just those selling CRM - is trying to build some level of intelligence into its products. SAP is the most slow IT giant in terms of transition to the cloud technologies. Nevertheless, it's the world's largest software company and any of its steps to the Cloud serves as an indicator for all large corporations: "if even SAP released a SaaS-solution, then SaaS-solutions can indeed be trusted" or "if even SAP offers a version for Amazon Web Services, than this platform is really enterprise-ready". This week at the SAPPhire conference, the company reported on its cloud transition steps. First of all, the SaaS ERP-service SAP Business ByDesign is already used by 500 with a target of having 1000 signed up by the end of the year. Second, SAP has announced that it's "launching" the SaaS CRM-service SAP Sales OnDemand, which will be followed by a travel management cloud service and an on-demand suite for talent management. And third, SAP has started to adapt its existing systems for the Amazon and Microsoft cloud platforms. SAP has certified two of its applications (SAP Rapid Deployment and SAP Business Objects, account for about half of SAP’s business) to work on top of Amazon cloud and, soon, SAP ERP software will be certified for Amazon cloud. As for Windows Azure, SAP applications are not ready yet to run on this platform, but SAP will provide the tools for developers using .NET and Windows Azure, that will help them to interact with SAP systems. In addition, SAP will integrate its applications with virtualization system Microsoft Windows Server Hyper-V to make it ready for the private clouds.